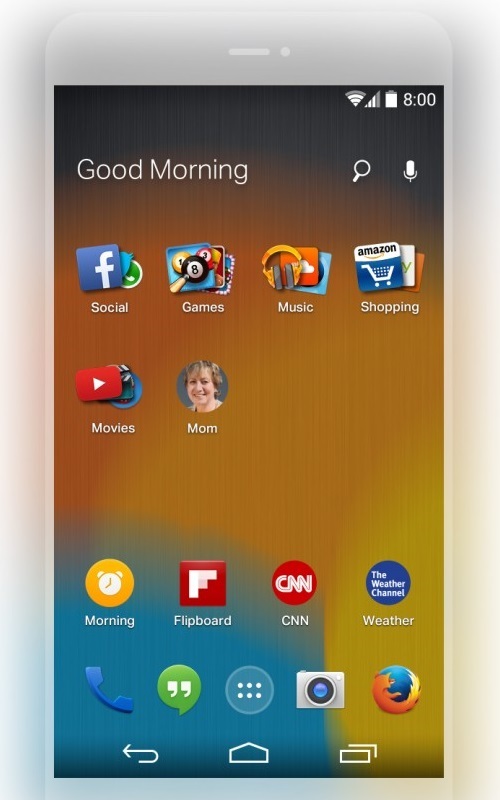 Mozilla today offered a sneak peek at its upcoming Firefox Launcher for Android. The organization has teamed up with EverythingMe, which will power the contextual adaptive app search. As you can see, the early version of the launcher lets you group apps into categories and pin contacts for easy access. The search icon above presumably leads to EverythingMe while the microphone icon is probably the usual Google voice search on Android. There’s what appears to be an alarm clock app, but other than that other apps all look alike, with Chrome naturally swapped out for Firefox. Other than that, Mozilla is throwing around phrases like “makes it easy to discover the content you want in any moment, “optimized for the way you use your phone,” and “a personalized and customizable Web experience that is fun and intuitive.” With no specific features to go on, it’s difficult to say whether this Android launcher will be able to differentiate itself effectively from the many options out there. EverythingMe released the first version of its Android launcher last year, with a search-focused approach. However, the Israeli startup found that not many people actually like to search on their phones, and you can be a lot more successful if you give users what they want, when they want it, without them having to do anything. In fact, they’ve found that there are 20 times the amount of interactions per day with their contextual homescreen than with the previous version. Mozilla knows it will be very difficult to convince Android users to use its launcher over another. It’s hoping EverythingMe’s unique approach will help.